So exactly how do whales make it look so easy to take such a huge gulp? As it turns out, they basically have nerves that act like bungee cords in their jaws, a new study has found. The study, performed by scientists at the University of British Columbia, examined the nerves within the jaws of whales and found that they are so stretchy that they allow the mouth and the tongue to nearly double in size when they take a gulp. The findings were published in the journal Current Biology. Nerves tend to not be elastic, but the researchers found that for a family of whales known as Rorquals, which includes the blue and fin whales, it is different for the ones in their jaws. It’s a discovery that’s amazed scientists because it presents a quality that is basically unseen in vertebrates — any creature with a backbone. One scientists who worked on the study was quoted in media reports as saying that the finding suggests that the science world apparently knows very little about even basic anatomy for the largest animals in the ocean, and provide some fascinating insights into the evolution of whales over eons as they faced new challenges. It explains how whales can have that huge pouch under their mouth areas, which allows it to capture a huge amount of food in a single bite. Typically, nerves tend to be a fixed length in vertebrates. Rorquals are massive, and can reach up to 80 tons, the largest of the baleen whales. As a result of their size, evolution had to do some tricky things to allow them to survive and thrive, and this appears to be one of them. The whales must feed by gulping in a gigantic amount of water, swelling up like a balloon in order to capture as much prey as possible, and then blowing out the water. In fact, a whale can take on more water than its own entire mass in one gulp. In order to do this, it would need a significantly different anatomy for its tongue and mouth blubber to let it be deformed in such a way without damage to the animal. But this study shows it was more than cosmetic changes that were needed: it also needed modifications to the tissues and the nerves themselves. For most vertebrates, including humans, stretching the nerves would include damaging them. That’s exactly what a hamstring injury is for a high-speed runner who suddenly pulls up, and why we stretch before doing strenuous physical activity — to avoid a suddenly overstretching of the nerves that would result in a painful injury. But in whales, the nerve cells are packaged in an entirely different way. They can be found in the central core and are rolled up in a way so that individual nerve fibers can be unfolded rather than actually stretched. Scientists have a lot more work to do, as they will delve deeper into the issue and try to understand exactly how the nerve core is folded to allow for this sudden unpacking of the nerves, and then repacking, as it feeds. They also may look into other animals — such as, say, frogs with their throats and chameleons with their tongues — to see if this happens elsewhere in the animal kingdom. It is this feeding strategy that allows whales to swell to the massive size that they are, with the blue whale being the largest creature on Earth. A study a few years back found that a single mouthful by these whales can contain about 457,000 calories, which is 240 times the energy it takes to take in that mouthful. These whales feed on krill, which are tiny crustaceans. They use plates of baleen that is made out of keratin in order to filter out these tiny animals, which it must consume vast quantities of in order to meet its daily caloric intake levels. Baleen is made out of the same kind of stuff that is found in our hair and fingernails. The whales feed by suddenly lunging into a school of krill and opening their mouths a whopping 80 degrees to suddenly inflate and draw in water, sucking in the school of krill as well as a huge quantity of water. Then, it pushes the water out through the baleen, leaving a tasty krill meal. In one dive, a whale can make six lunges, according to that study. A single lunge can cost a whale about 1,900 calories — about how many calories a human needs in a whole day. But despite the high-energy hunting method, it pays off big time for the massive creatures, who are some of the most efficient animals on the planet when it comes to feeding. Blue whales are huge — they can grow to nearly 100 feet in length and weigh 190 tonnes, and it is not only the largest existing mammal, but also the heaviest that has ever lived on our planet. The whale has a long and slender body that tends to be a bluish-gray color. One subspecies of the whale can be found in the North Atlantic and North Pacific, while a second can be found in the Southern Ocean, and a third live sin the Indian and South Pacific oceans. Blue whales were nearly hunted to extinction in the early 20th century, but were protected internationally in 1966. 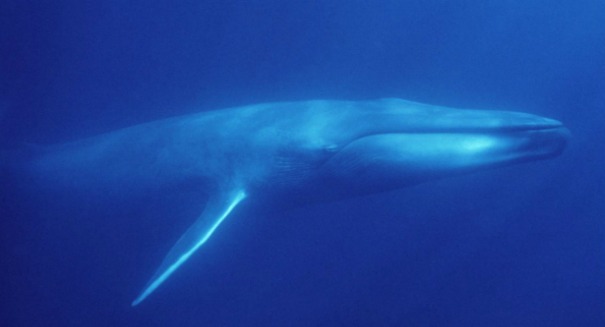 The fin whale, meanwhile, is the second largest animal after the blue whale, and it can grow up to 90 feet in length and weigh nearly 74 tonnes — making it nearly as long but not nearly as heavy as its cousin. It is a slender creature that can move at tremendous speeds because of its lower weight and streamlined figure. This species of whale is more of a brownish-grey color.